The seed for Robert Blattberg's interest in retail and marketing was planted during his undergraduate years, when he worked part-time at a grocery store to pay his tuition at Northwestern University. His interest grew during his junior year, when, by chance, he decided to take Professor Dirk Van Alystane's course in quantitative methods. "I was somewhat interested in marketing before that," says Blattberg, who had made up his mind to apply to law school. "Van Alystane was the one who took me aside, asked me what I planned to do with my life, and then encouraged me to apply to business school." A graduate of Carnegie Mellon's business school and marketing professor at the University of Chicago's Graduate School of Business since 1969, Blattberg returned to Northwestern in 1991 when he became the Polk Brothers Distinguished Professor of Retailing and Marketing and director of the Center of Retail Management at Kellogg, a position he has held the last 17 years. "Northwestern has been a great place for me," says Blattberg. "Coming to Northwestern gave me a chance to move to the next level in my career and to delve further into retail and retail behavior, something I am extremely interested in. I've also really enjoyed the chance to participate in the doctoral program and work closely with the PhD students." 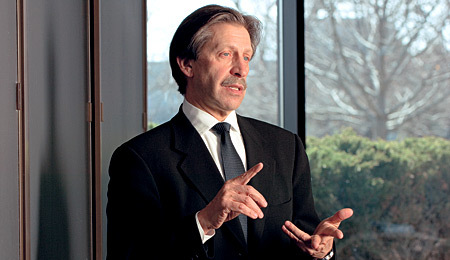 During his Northwestern tenure, Blattberg helped build a strong quantitative group in the Marketing Department. He says the department has been successful in attracting talented young faculty, "something not so easy to do in the quantitative field," he admits. Blattberg, who was still working on his doctorate in industrial administration when he began teaching at the University of Chicago, had until then focused on econometrics. It was his decision to teach marketing instead of finance that began his shift into the industry where he has played a major transformative role. Never happy with answering questions posed by other marketing scholars, Blattberg asked himself what questions should be posed in the first place and soon became one of the leading researchers in the field of quantitative marketing, including sales promotion research, customer equity management and retailing behavior. In addition to writing four books, he has produced numerous articles for leading academic journals, the monograph Assessing and Capturing the Soft Benefits of Scanning and a five-part set of monographs on category management. He also has consulted for several major companies, including Sears, Kroger, Jewel-Osco and Rite Aid. "Blattberg is among a handful of scholars who have dominated the field of quantitative marketing for the last four decades," says colleague Lakshman Krishnamurthi, the A. Montgomery Ward Professor of Marketing. "Throughout his career he has been at the forefront, setting trends and writing books on topics as they just began to emerge in the industry. While his research is sophisticated, it is also accessible and can be applied in the real world. He has made the field what it is today. He is a genuine superstar." Although retiring after a 41-year teaching career, Blattberg is not hanging up his hat. He is already at work on a fifth book about the lifetime value of customers and plans to continue to serve as director of First Horizon National Corp., Price Chopper, and Mannatech Inc. He is also eager to spend more time growing the investment challenge pilot program he has started in several Colorado high schools and to serve as director of the Center of Marketing Technology and Information at Carnegie Mellon. Blattberg says he's enthusiastic about these opportunities, including the chance to help younger students learn about economics, finance and money management. "It feels good to have the chance to give back," he says.